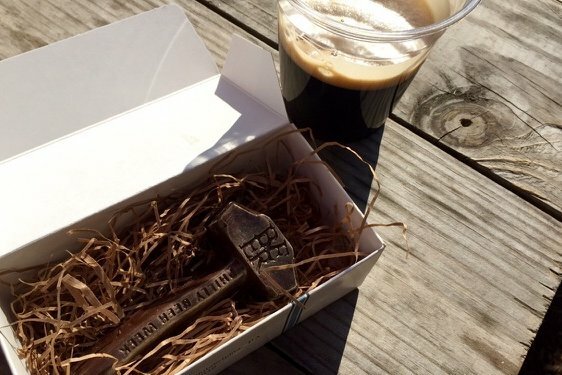 A miniature chocolate version of the Philly Beer Week hammer sits next to a pint of Fire, Flood and Plague at Spruce Street Harbor Park. Philly Beer Week will kick off on June 3 this year. Last year, there were more than 1,000 events in 10 days, and this year will feature just as many. New for 2016 is being able to search on the Philly Beer Week website by category or date, which makes weeding through hundreds of beer-related events much more manageable. Still, there's a lot going on in a 10-day span, especially with the website updating daily. If you're not sure where to start, take a cue from the event's board of directors -- all industry professionals -- and check out these highlights. Philly Beer Week's kickoff event will be held at The Fillmore. Look for the debuts of two collaboration beers: Fire, Flood and Plague and Brotherly Suds 7. 2016 is the eighth year the Great Beer Expo has made an appearance in Philly. Breweries from all over will present their beers for attendees, with more than 200 beers available to sample. Thirteen hours of beer tastings await attendees of Craft Beer Day in East Passyunk. Look out for tap takeovers, live music and ice cream floats made with beer while there. The Delaware River Waterfront hot spot is the official beer garden for Philly Beer Week. At Spruce Street Harbor Park, there will be a range of Beer Week events. One will showcase women involved with beer on June 8, while another will feature brewers competing in a swan boat obstacle course on June 9. Check the Philly Beer Week website for updates on times, which are not yet available. Breweries compete in a series of "Double Dare"-inspired physical challenges. A scavenger hunt will take place through West Philly and University City, where participants will solve Philadelphia beer clues. The hunt ends at Dock Street Brewery with a free music fest. Enjoy beer and pizza from the bar, as well.